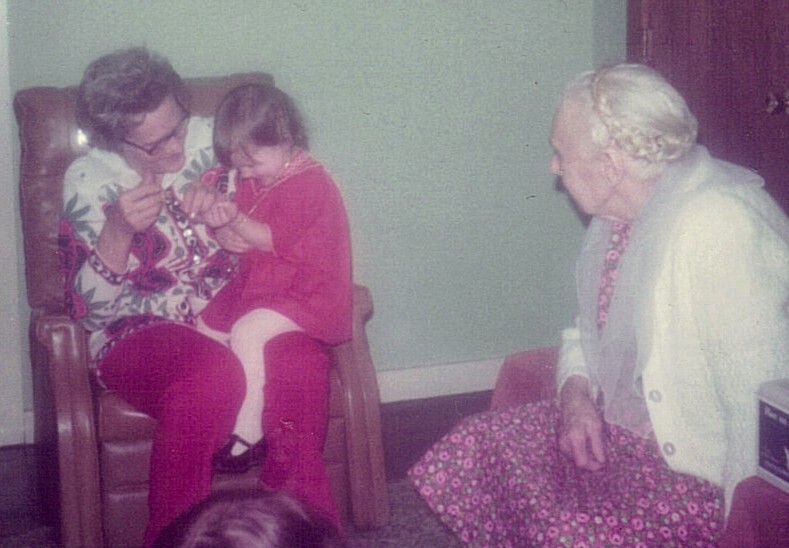 That’s me giggling on Grandma Burla’s lap while my Great Grandma Jane looks on. Playing ring around the rosey in the side yard where the sweet william bloomed. Games of button, button, who’s got the button, hide and seek, crazy eights and old maid. Cutting roses, flags (irises), mountain laurel and peonies from the front yard. Making popcorn and grilled cheese sandwiches in the same skillet on a gas stove. The tick, tick, tick of the gas stove lighting and then the sulphur smell of matches. Dirty socks from running around shoeless in a house with a coal-burning stove. A TV tray at the front door with Halloween candy laid out, waiting for trick-or-treaters. And Sunday dinners (usually ham) and playing in the creek and “bless your heart” when I was sad and a jewelry box that unfolded when you lifted the lid and head scarves and white sweaters . . . But most of all, I remember, “I love you a bushel and a peck and a hug around the neck.” Followed by the most wonderful, I-love-you-forever Grandma hugs. And even though she’s gone, I know she does love me forever. And I love her, too. A bushel and a peck that run clear to heaven and back again. This is so vivid and beautiful! So sorry she passed. Thanks, Heather. One of those hard blessings! I sure remember those ham dinners on Sundays. I also remember many “cook-outs” and ambrosia for dessert. One of the best times I remember was playing kick-the-can with you, David and Daniel all the way from our farm to her house on one Mother’s Day to take her some cards and a present. She was a good woman! I remember that game of kick the can! I knew we were going to Grandma’s, but didn’t remember why. Yes, ambrosia with miniature marshmallows. Wish I had that recipe. Lovely and perfect. Here’s the poem I was thinking of when you gave me the title. It would work as well, I think.